There is currently no north/south bus access to Maimonides Hospital. Trips from Bay Ridge and Bensonhurst are time consuming , indirect and inconvenient. Going West from 60th Street to 13th Avenue North, you first have to go to Fort Hamilton Parkway. North South and East / West Bus service to Maimonides Hospital is direct, simple and convenient. Although the 13th Avenue Bridge was completed in 1937 to connect the northern portion of 13th Avenue with the southern portion, bus routes were never updated to take advantage of this connection. As a result, it is very difficult to travel along 13th Avenue between Borough Park and Bensonhurst. A short ten minute trip easily can take from 30 to 45 minutes. Going West from 60th Street to 13th Avenue North, you first have to go to Fort Hamilton Parkway. 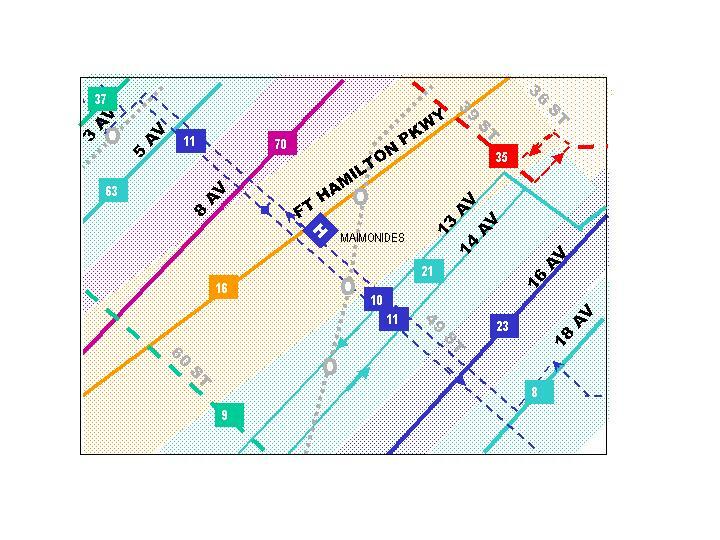 Traveling through on 13th Avenue requires you to first detour to Fort Hamilton Parkway before returning to 13th Avenue. 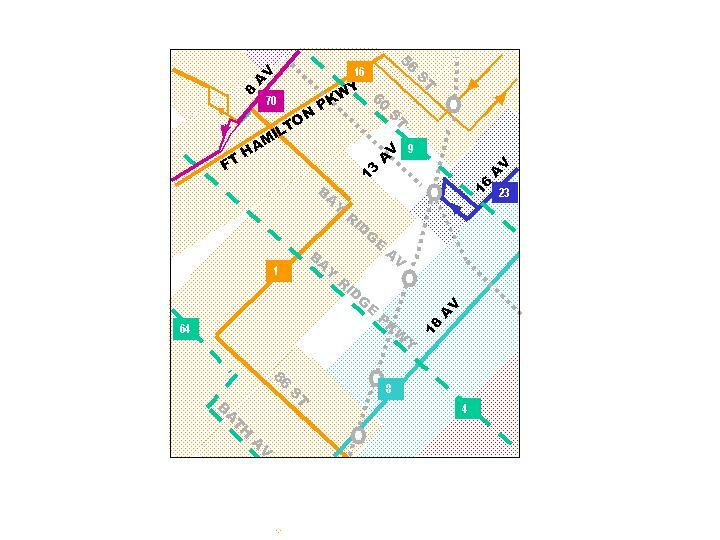 Going west from 60th Street to 13th Avenue South is not even possible with two buses. 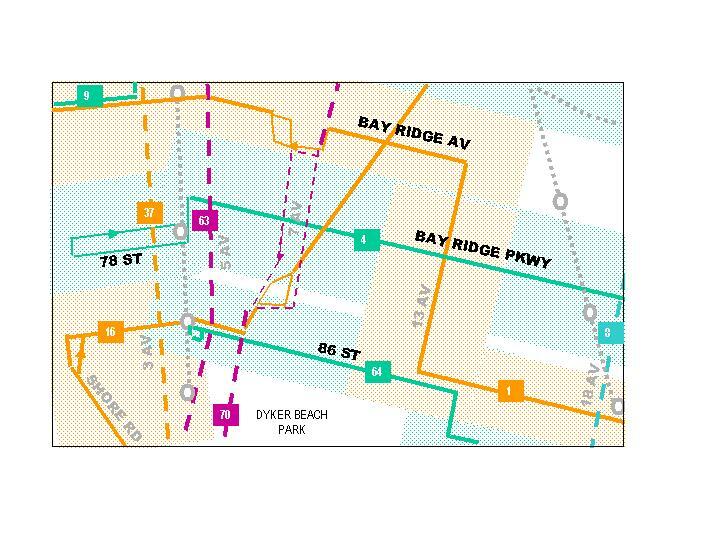 You cannot even use the 60th Street route, which would be the most logical choice. 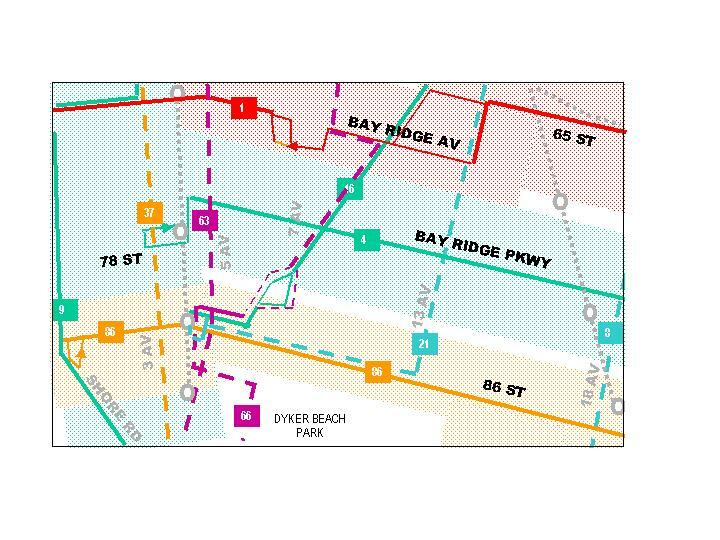 You first have to walk to either 18th Avenue or Bay Parkway, and ride south indirectly to 86th Street before traveling back north on 13th Avenue. Shaded area indicates service area ¼ mile from north-south bus route. Travel along 13th Avenue is direct, simple and convenient. Shaded area indicates service area ¼ mile from east-west bus route. Travel between western Bay Ridge and Bensonhurst along 86th Street requires three buses and two fares or unnecessarily long trips that require indirect routing. There also is a service gap in the vicinity of 65th Street. 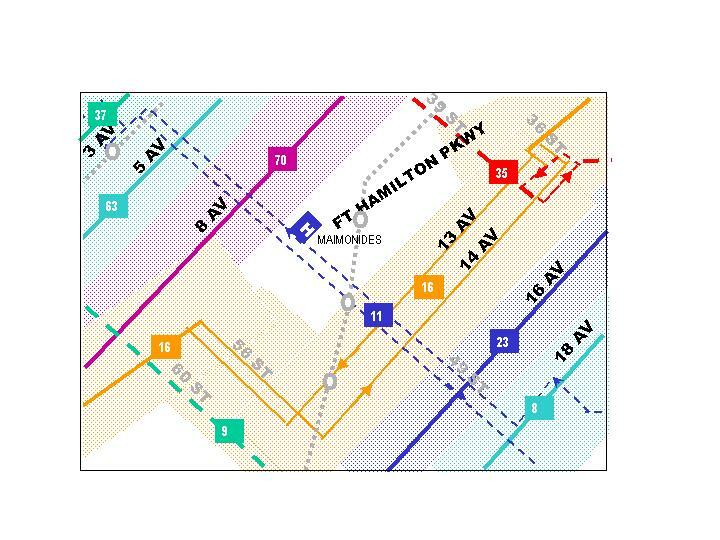 For example, to get from the Fort Hamilton area around 95th Street to 86th Street in Bensonhurst, it is necessary to take the B63 on Fifth Avenue and travel nearly a mile out of the way to Bay Ridge Avenue (69th Street) before changing for the B1 to travel back along 13th Avenue to reach 86th Street. 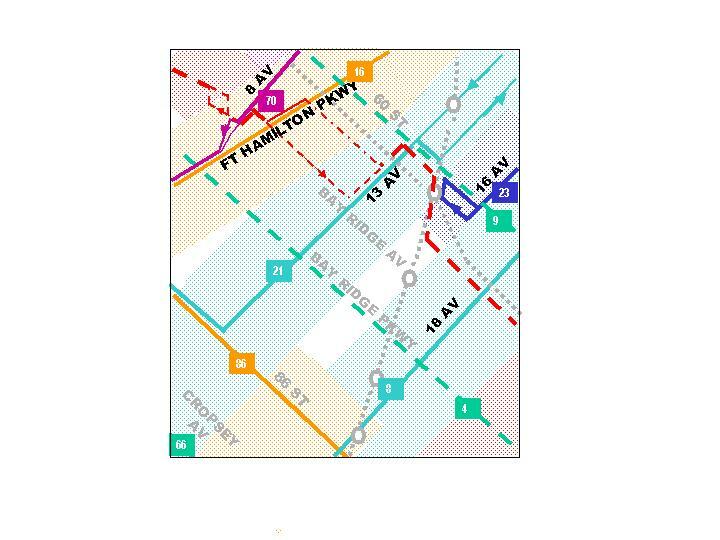 The alternative is a more expensive direct route using the Fifth Avenue bus and two buses along 86th Street which can be more time consuming especially during off hours. Similar problems exist accessing the VA Hospital in Fort Hamilton. Travel along 86th Street is direct, simple and convenient. Accessing the Brooklyn VA Hospital is much easier and there is no longer a service gap along 65th Street. 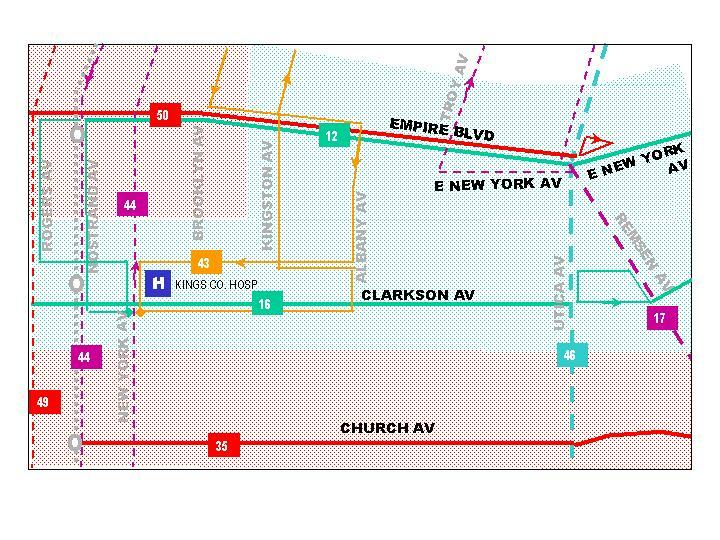 Although only one or two blocks of Empire Blvd does not have bus service, traversing the corridor is very difficult necessitating long trips that require indirect routing. 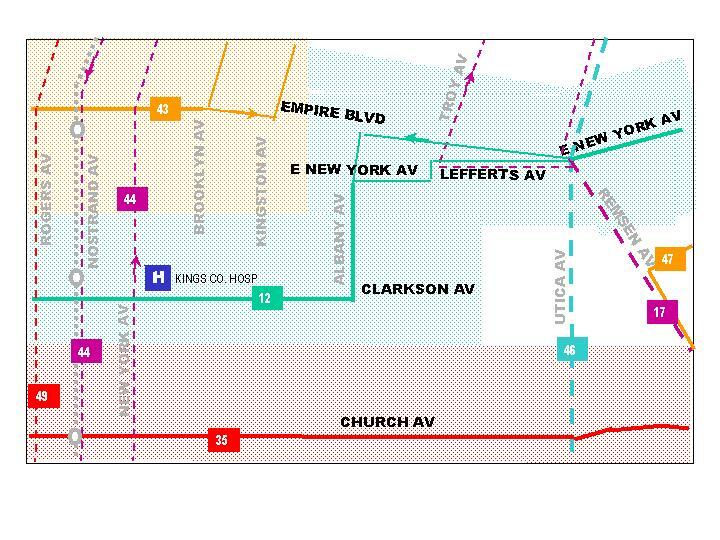 There also is a service gap along Clarkson Avenue between Albany and Remsen Avenues. Bus riders are required to walk extra distances to and from Church Avenue to access the B35 and are unable to use the B12. Travel along Empire Blvd and Clarkson Avenue is direct, simple and convenient. Access to Kings County Hospital is greatly improved.